Hansgrohe Focus Monotrou Bath Mixer Tap£113.10 inc.VATRRP: £174.00 (Save 35%)Featuring Hansgrohe's patented 'Quick-Clean' easy to maintain sparkling chrome finish and Air Power spray. VitrA Minimax S Monobloc Bath Tap£145.61 inc.VATRRP: £224.00 (Save 35%)One tap hole bath filler, mixing hot and cold water in one single bath tap to save space! With a vast selection of bathroom products and accessories available, UK Bathrooms provide you with the cheapest prices you can find anywhere. Free delivery is available on some items, allowing you to save even more money. 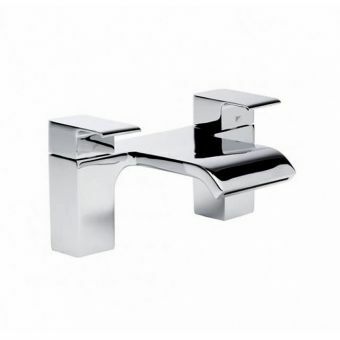 You can choose from both modern and traditional bath mixer taps on our website. It is possible to filter the results by a number of other settings in order to bring up suitable products for you, including price range. 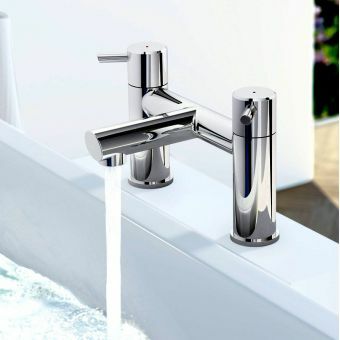 One of the cheaper options within this product line is the Joyou Evok Deck Mounted Bath Filler Tap. 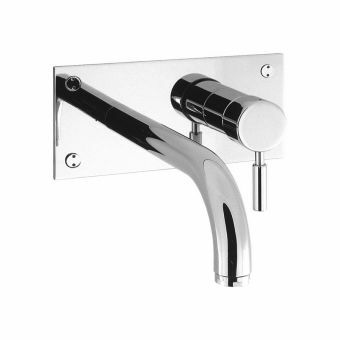 Available in a classy chrome finish, this complements any modern bathroom well. 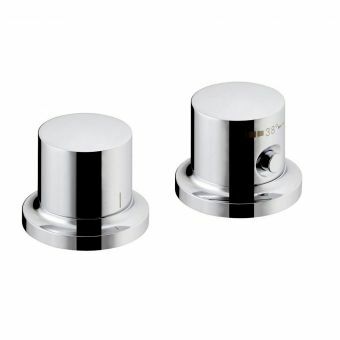 It has a minimum recommended pressure of 0.2 bar and is suitable for low pressure water systems. Its luxurious design and easy operation at an affordable price makes it popular with many customers. 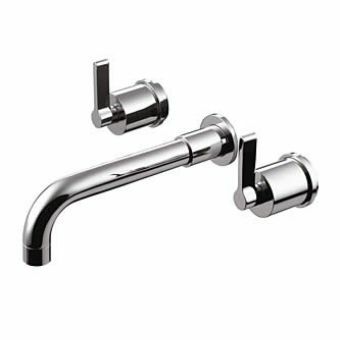 If your budget is able to stretch a bit further, one of our higher end products is the Roper Rhodes Reef Bath/Shower Mixer. This deck mounted product is very easy to use and is WRAS approved. It goes through comprehensive quality control tests during the production process and comes with a five year guarantee. 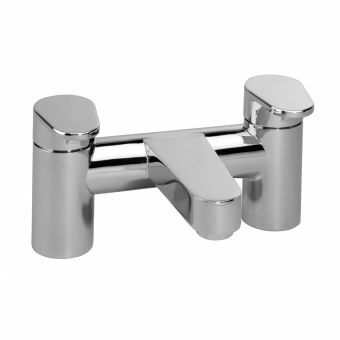 Available in a classy chrome finish, it works well in many modern bathrooms with high pressure water systems. At UK Bathrooms, we aim to deliver your order as quickly as possible. We use trusted and reliable couriers to ensure our products arrive in optimum condition. A variety of payment options, including finance plans on some items, are available. 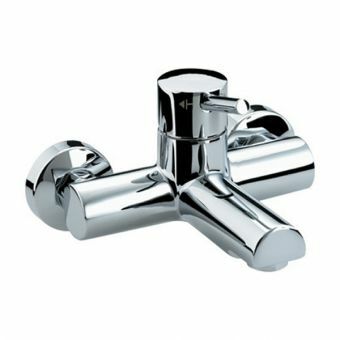 Mixer taps allow water to be drawn from both hot and cold pipes, mixing the water from each pipe before it flows out into your bath or basin through a single spout. This allows you to achieve the water temperature you want first time, without the risk of scalding yourself or experiencing the shrieking unpleasantness of water that is frightfully cold! 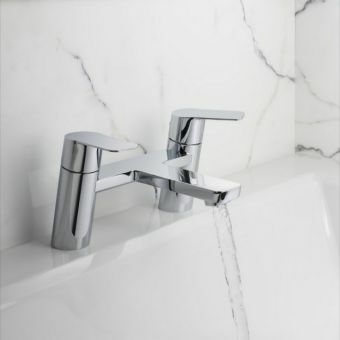 If you wish to indulge in a bath that is the perfect temperature just for you on a regular basis, mixer taps are a good option. While using baths with a hot and a cold tap, each with their own separate spout, most people have experienced the disappointment of allowing the bath to fill up, only to discover the water is either too hot or too cold when it comes to testing. This is followed by the inconvenience of having to let some of the water out - particularly tricky if you're having to remove the plug from a bath that's too hot! - before more hot or cold water is added. Not only is this time consuming, it's also very wasteful when water is such a precious commodity. 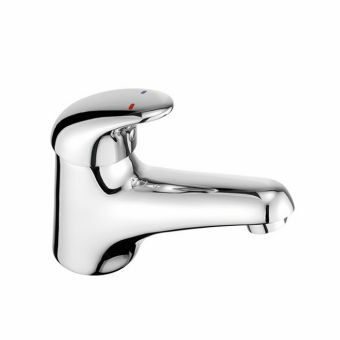 Mixer taps save you from the waste and inconvenience - not to mention possible injury - as the water can be mixed to the optimum temperature before your bath fills up. 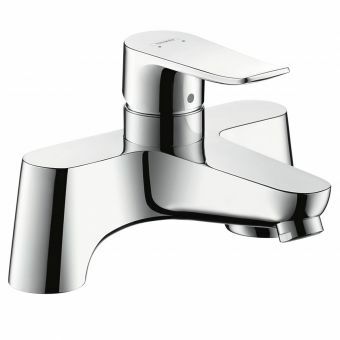 Hansgrohe offer a range of excellent quality mixer taps, which are in keeping with the high standard of all its products. Whenever you use Hansgrohe products, you will notice the attention which has been devoted to their supreme design quality and finish. Made in Germany, renowned for its brilliant engineering, the company distributes its high-end products around the world. According to the company, its recipe for success "is tradition-based innovation coupled with sustainable corporate thinking – all enhanced by its great passion for the element water." 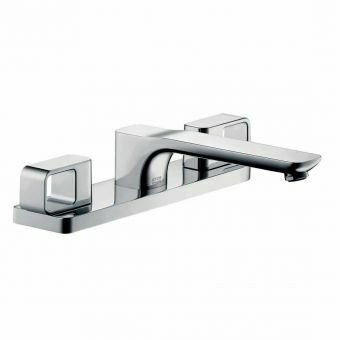 Hansgrohe's Focus Single Lever Bath filler, as its name suggests, gives your bathroom a stylish focal point, which, from both a design and functionality point of view, is a cut above standard bathroom brassware. 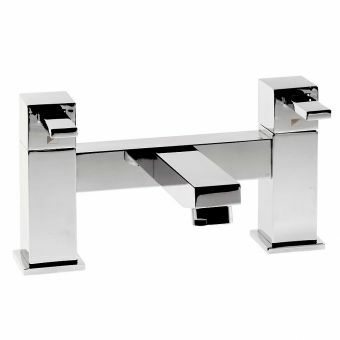 Fitted to the deck mounting area of the bathtub with twin holes, this modern take on a classic bath mixer design is eminently European in its design. Softened with stylised curves, the strong outward appearance of the Focus Rim Mounted Bath Filler mirrors its robust internal engineering. 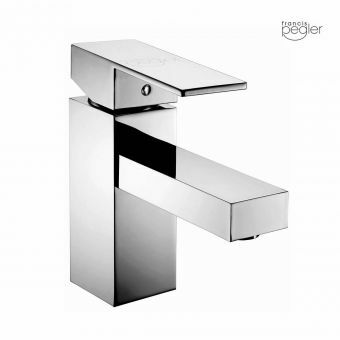 The brass is coated in chrome for a suitably modern finish and a corrosion resistant skin. 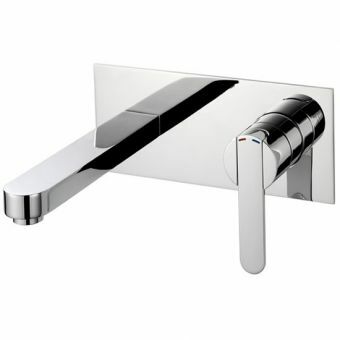 Like the stylish and elegant Hansgrohe Monotrou Single Lever Bath Mixer, it is controlled via a single lever handle. The internal ceramic cartridge not only keeps the movement of the unit smooth and natural, but eliminates annoying and wasteful drips. The Focus is specifically designed for use with low pressure systems, opening up the design possibilities for this type of bathroom. Bearing long term running costs and environmental impact in mind, Hansgrohe have included in this piece the AirPower aerator system, blending water with air to create a soft mix that lowers consumption. The Monotrou is also stylish and elegant, making a striking statement. Like the Focus, it is ideal for mounting on the bath rim and water flow is controlled by a ceramic cartridge for maximum efficiency. The Monotrou features temperature restriction to avoid scalding and is suitable for continuous flow water heaters. The Logis Bath Spout brings a strong, confident aspect to the bathing area. 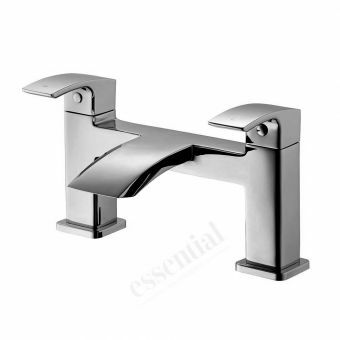 Its strong, obelisk style design and chrome mounting escutcheon make it the ideal choice for the fashionable, cosmopolitan interior. 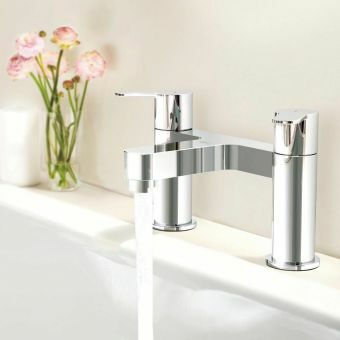 Meanwhile, the Ecostat Comfort Exposed Thermostatic Bath Mixer manages to be economic as well as elegant, as it features a steady eco-friendly flow rate to cut down on the amount of water you use - particularly effective for households on a water meter. GROHE bathroom taps shine, thanks to a winning combination of award-winning design, utilisation of the finest materials - and the latest industry-leading technologies. 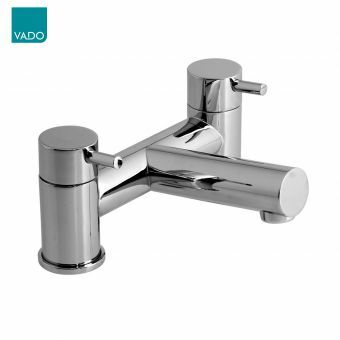 Every collection offers a wide choice of taps, which go hand-in-hand with the latest bathroom interior design and materials that can also be matched to complement your personal taste. 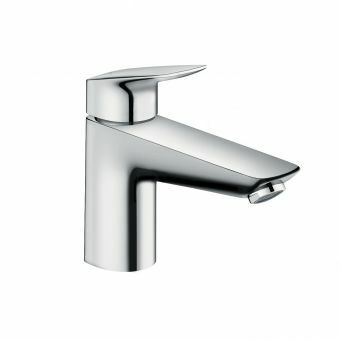 The Grohe Veris Single Lever Wall Mounted Bath Mixer features a high pressure bathroom tap of innovative, contemporary design. 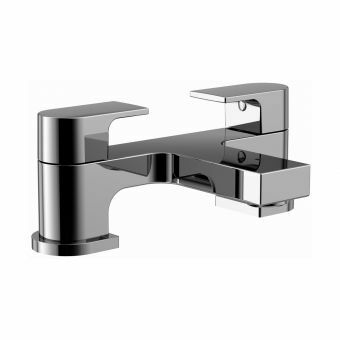 It provides a clean look, with the chrome on brass materials adding a touch of shine. 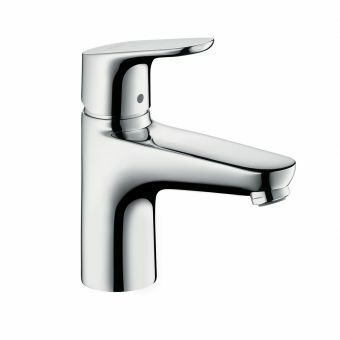 This tap incorporates flush wall installation with concealed connections, and as Grohe guarantees it for five years, you can spend a leisurely evening relaxing with peace of mind. 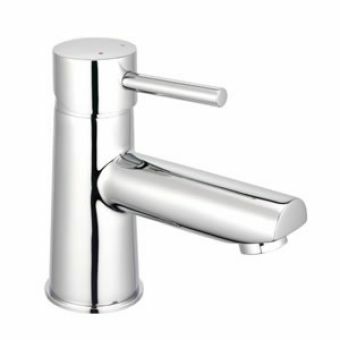 The luxuriously stylish Crosswater collection of iconic bathroom taps, mixers and shower valves are manufactured from the highest quality brassware and have a stunning, polished chrome finish for that contemporary feel. 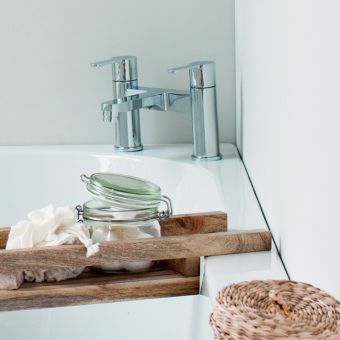 Ideal for a delightful finishing touch in your perfect bathroom! 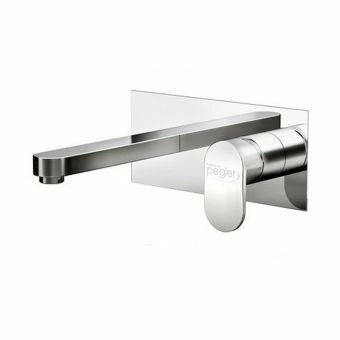 The Crosswater Design Wall Mounted Bath Filler is a modern masterpiece, bringing a real sense of style to the modern washroom. The beautiful design provides a luxury hotel or spa experience and produces a harmonious flow of water to fill the bath at your perfect temperature. The uncluttered feel and clean lines are helped by hidden screws and covers in complimentary chrome. 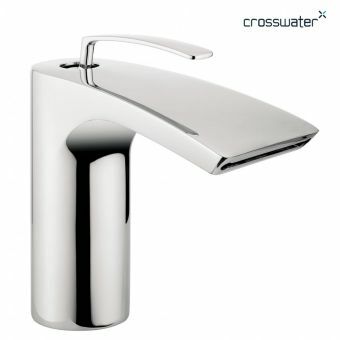 The Crosswater Design Bath Filler provides the same simplistic elegance, but is deck-mounted. 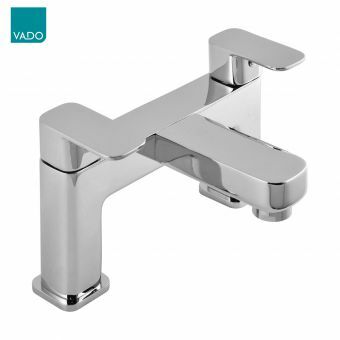 Strong construction and aesthetics in a single unit, cast in the classic H-shape with central spout, this is a simple and modern piece offering easy maintenance and cleaning with a simple wipe-down. As an optional extra, a set of extended legs is available for this unit, so it can be used with a free-standing bathtub. This mixer is suitable for use with low pressure water systems. 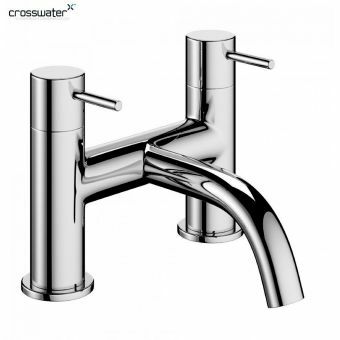 The Crosswater Essence bath filler offers similar style and dependability, but offers a really quite different look, with its cylindrical and rectangular spout holding the lever atop. As with all Crosswater products, simple elegance and understated style come as standard - and this unit also comes with a 15-year guarantee. 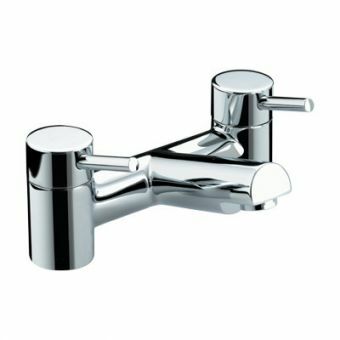 The Crosswater Belgravia three-hole bath mixer tap is a great option for people who like the convenience of a mixer spout, but want to be able to control the hot and cold water flows separately. 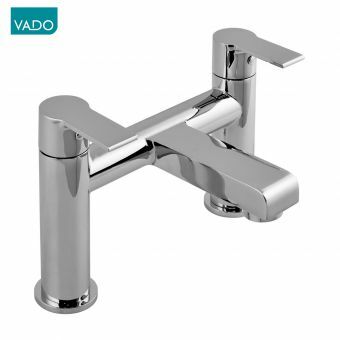 The Edwardian style of the taps provides a traditional feel and sheer white ceramic, angled levers or traditional crosshead styles, add a definite sense of this classic period. 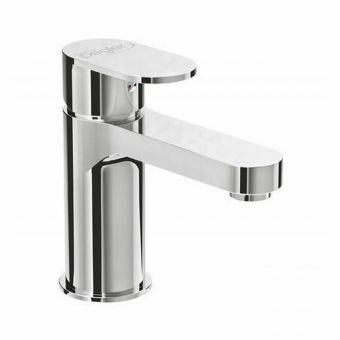 If it's traditional you're looking for, Burlington taps are definitely worth considering, adding a beautiful finish to any period fittings, with classic crosshead and lever handle designs. 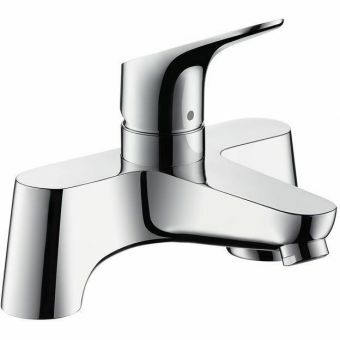 Options in this stunning range include wall and deck mounted mixer taps, basin taps, and mono basin mixers, and help you to show off your unique style. Taps come in white Burlington boxes, with cut out foam internal, so you can be sure these products will reach you in perfect condition. 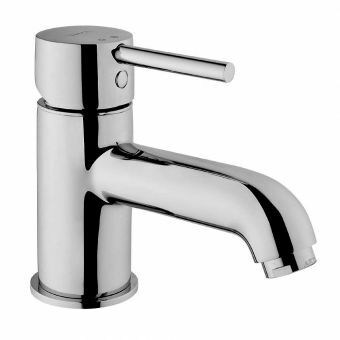 All are manufactured from brass and chrome, while tap indices, telephone handsets, diverters, bath plug indices and the overflow filler indices are ceramic - not plastic! 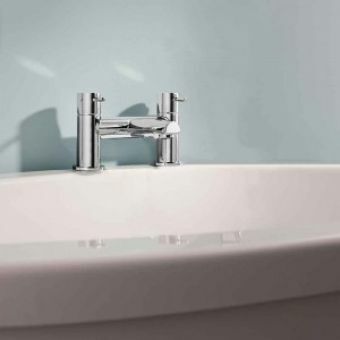 The Burlington overflow bath filler is a modern alternative to some of the more traditional offerings from the manufacturer, such as the Anglesey Regent and Anglesey deck mounted bath fillers. The overflow bath filler is an aesthetically pleasing design, with its perfect circular tap, which removes the need for traditional bath fillers or taps and creates a sleek profile in the bathing area as a whole. 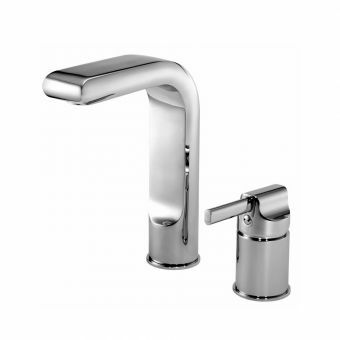 Etched with the prestigious Burlington London name, it presents a professional and high class finish, which would be equally at home in a domestic setting or high quality hotel or spa. 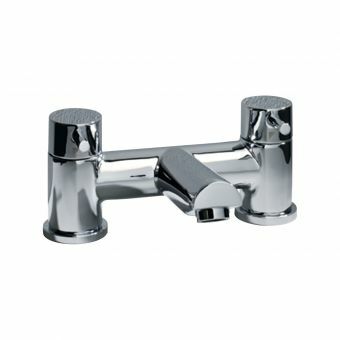 The Anglesey Regent and the Anglesey deck mounted bath fillers from Burlington are both traditional and sophisticated. The immediately recognisable Victorian style makes Anglesey an obvious choice for those looking to recreate the classic interior - or to add a piece of vintage cool to modern interiors. 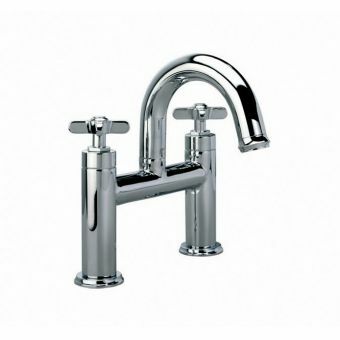 The Anglesey Regent features upwardly turned control valves, while the Anglesey features right angled mixer valves. 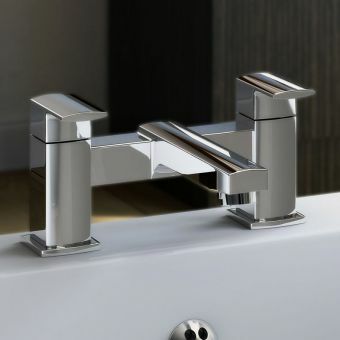 Kensington deck and wall mounted bath fillers from Burlington also provide a traditional option, with their classic ceramic handles and chrome finish, which combine the modern and the traditional. Dornbracht premium fittings reflect the high quality manufacturing and innovative design that have become synonymous with this family-run company. The international award winning manufacturer relies on progressive production that uses the latest technology as the secret to its success. Its philosophy that change should never be regarded as constraint, but as opportunity, has made it a world-leader in its field.